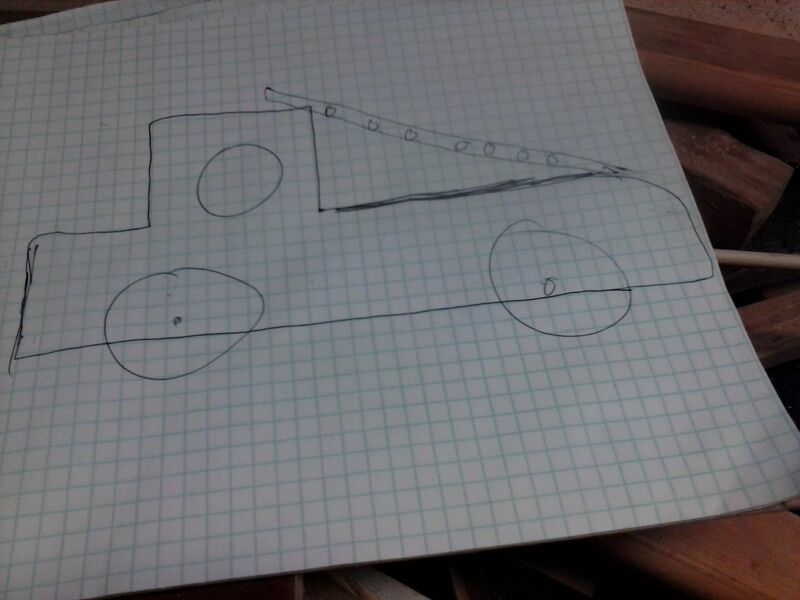 I am still working on making wooden trucks.I have a sketch that I made of a fire truck that I hope to complete this winter. It is very simple. 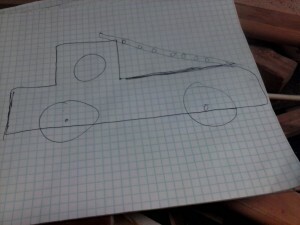 It is basically the pick up truck shape cut out with a slightly longer bed and the addition of a ladder. The ladder is just scrap wood and dowels and it attaches to the back of the truck with a dowel. I will paint the truck red and the ladder white. I am also brainstorming ideas for a helicopter, that has been a more difficult challenge. A helicopter is a complex vehicle to model. It is easy to get carried away ,but I want something simple that is still recognizable as a helicopter. I will give it wheels instead of ski’s and I want to have a top and side mount propeller. I have not been happy with any of the drawings I have started and I have yet to find a real world example that I like enough to reverse engineer. I will keep looking and thinking. 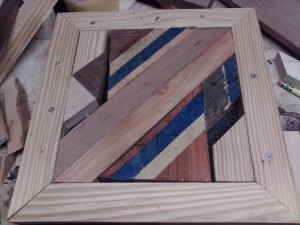 It hasn’t just been firetrucks and helicopters in the workshop, I started a small mosaic. I am not sure what I will do with it when it is complete, It may be the center for a larger project or I may leave it as is and put it up on etsy as a small wall hanging. This entry was posted in process, repurposeing, scrap wood by brighid. Bookmark the permalink.